In the May 20th, 1865 edition of Frank Leslie's Illustrated Weekly newspaper, this image was printed next to an article about President Lincoln's funeral train heading to Springfield, Illinois for burial. The train carrying Lincoln’s body traveled through 180 cities and seven states on its way to Springfield. Scheduled stops for the special funeral train were published in newspapers. 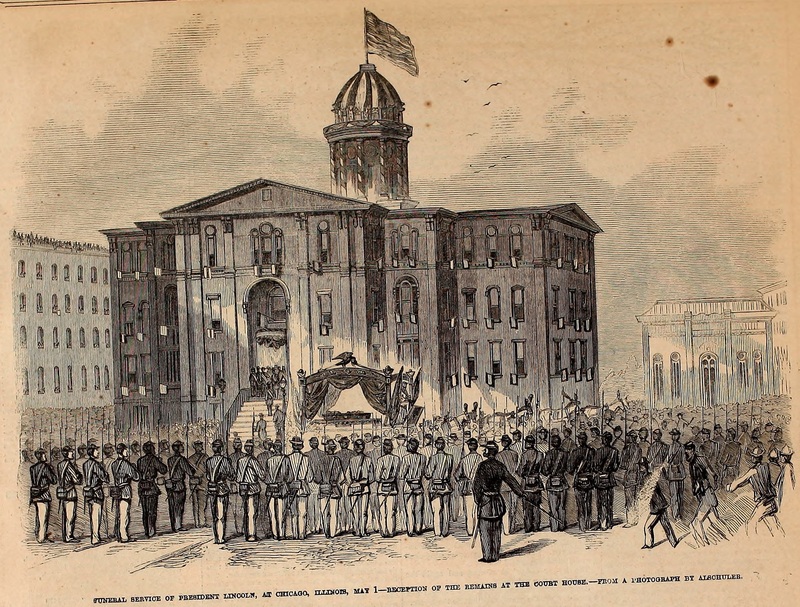 In ten cities, Lincoln’s casket was removed from the train for elaborate memorial services and public viewings. This image depicts the funeral procession for President Lincoln in Chicago. The illustrated literary and news publication was founded in 1855 and continued until 1922. It was one of several started by publisher and illustrator Frank Leslie. Leslie was a British engraver who came to the United States in 1848. The Illustrated Weekly followed a tested and proven formula of carefully combining elements of war, politics, art, science, travel and exploration, literature and the fine arts in each issue, enhanced with between 16 and 32 illustrations. By 1897 its circulation had grown to an estimated 65,000 copies. To request rights and permissions to use Lincoln Financial Foundation Collection images in research or publications, please download our image rights permission form: https://www.lincolncollection.org/access/image-rights-permissions/.